Central High School, located at Ogontz and Olney Avenues in North Philadelphia. The historic Central High School in Olney will soon embark on a $42 million renovation and expansion project that will transform the North Philadelphia campus for generations of students to come. Supported by a $10 million gift from Central High alumnus Joseph M. Field, the project will feature a new Performing Arts Center, outdoor spaces dedicated to STEM education and a brand new Student Commons anchored by a Digital Media & Technology Center. Central High, chartered in 1836, has been located at Ogontz and Olney Avenues since 1939. It is the second-oldest public high school in the United States and one of the last schools built in Philadelphia before the start of World War II. "Central High School ... provides opportunities for training and exhibition in the performing arts, but has lacked the physical facilities necessary to enhance and display performance characteristics in a state of the art manner,” Field said at the unveiling of the project. "It is my hope and endeavor, with the aid of fellow graduates of Central, to finance and construct the performing arts facility ... which should put Central’s performing arts on par of excellence with its liberal arts and sciences." The Style Moderne building, added to the National Register of Historic Places in 1986, is in need of significant repairs and capital improvements in addition to the new facilities planned for the five-acre campus. 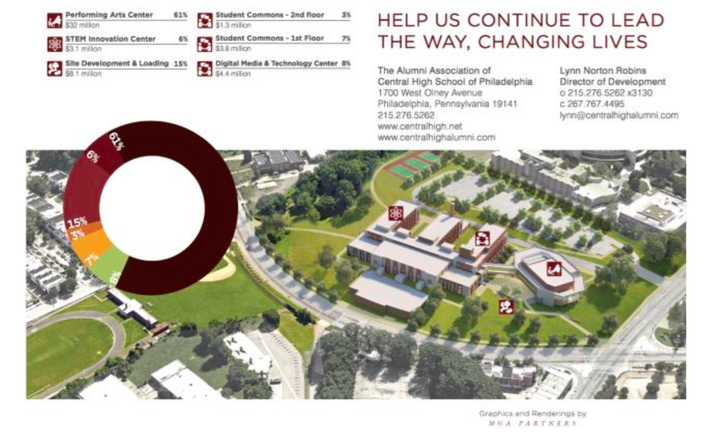 Field, also the founder of Bala Cynwyd-based radio broadcaster Entercom Communications, said he will match dollar for dollar most of the contributions made for the multi-phase expansion. Rendering of master plan for $42 million renovation, expansion of Central High School. The first phase of the project, situated on the north lawn of the campus, will be the construction of the Performing Arts Center, a 400-seat venue that will support musical, theatrical and dance performances. Extracurricular activities and rehearsal space will also be housed in the new facility, which is expected to break ground in January. 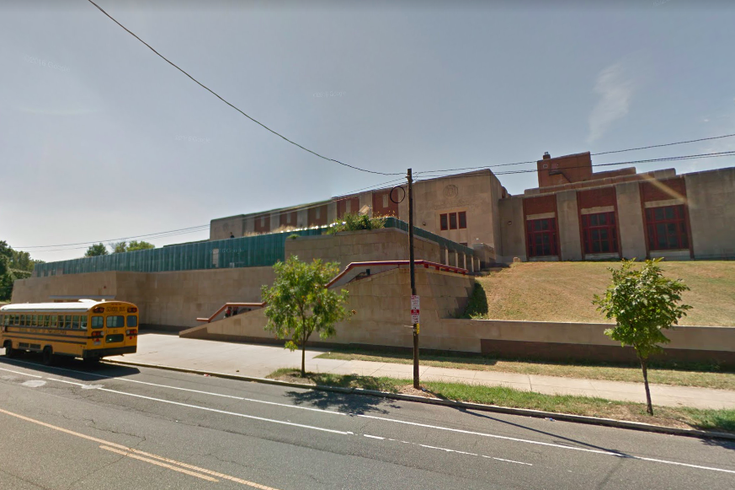 The School District of Philadelphia has approved $8.1 million in funding for site development and loading, including the outdoor classroom spaces and rehabilitation of a parking lot, driveways and deteriorating retaining walls. Plans call for relocating the existing vehicular entry away from the busy intersection of Olney and Ogontz avenues. A 3D model and renderings presented at the project's unveiling were prepared by MGA Partners of Philadelphia, the architectural firm selected to lead the renovation.